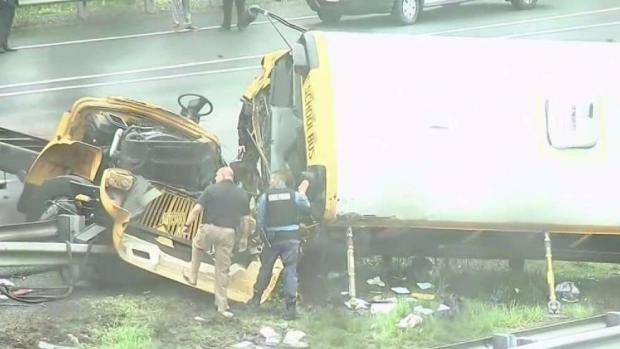 A student and teacher are dead after a full-size school bus collided with a dump truck on a major New Jersey highway Thursday, a violent accident that ripped the undercarriage completely off the bus and left it demolished on its side in the median. 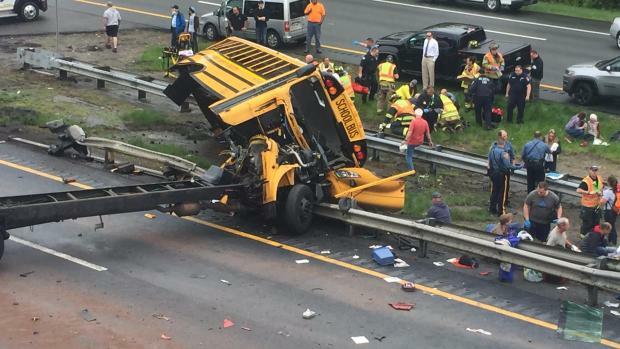 The bus, which was carrying 38 students and seven adults from East Brook Middle School in Paramus, crashed around 10:20 a.m. on Route 80 near exit 25 in Mount Olive Township, Gov. Phil Murphy said at a news conference in Paramus Thursday. Two were killed and the rest were injured, some critically. Multiple sources tell News 4 New York that video from a Department of Transportation camera shows the school bus making a sudden U-turn in a median. Multiple sources tell News 4 New York that video from a Department of Transportation camera shows the school bus making a sudden U-turn in a median. Pei-Sze Cheng reports. There were three school buses taking students from the same school on the field trip, sources said. Of the three buses, one missed the exit, video shows. When the driver realized this, he apparently saw a designated U-turn area for emergency vehicles ahead -- and cut across lanes of traffic to try to make the U-turn. A dump truck traveling in the same direction slammed into the bus as it suddenly appeared in front of him, the sources said, citing DOT footage. Investigation is still early, and no conclusion has been reached. State police said the truck driver had been interviewed following the wreck. The school bus driver is still being treated for injuries and has not yet been interviewed. The injured were transported to six different hospitals, and some are undergoing surgery. 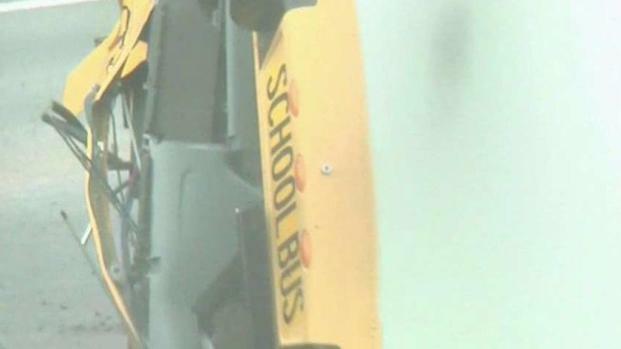 An 11-year-old boy sitting in the fourth row of the bus told News 4, "I heard like a scraping noise and then the bus tilted over, and a lot of people were screaming." 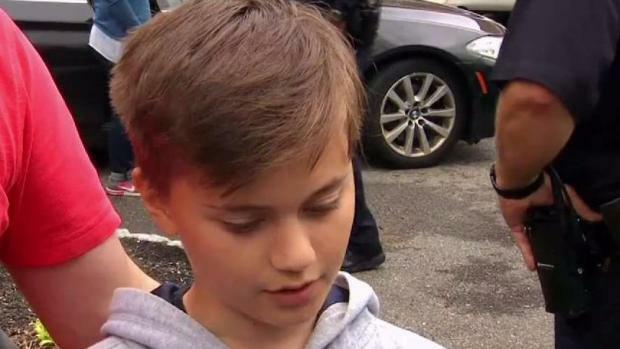 "People were screaming and some were hanging from their seatbelts," said the boy, who was among the 21 passengers taken to Morristown Medical Center; he was later released. 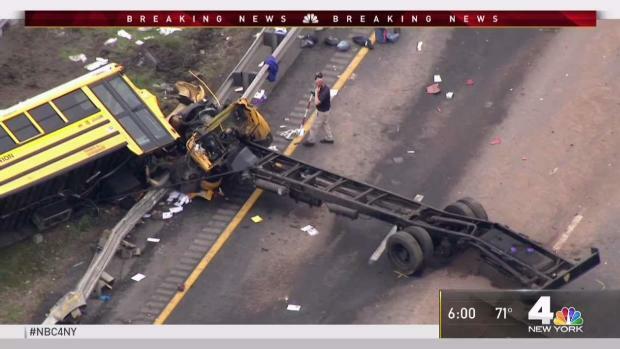 A student and teacher are dead after a full-size school bus collided with a dump truck on a major New Jersey highway Thursday, a violent accident that ripped the undercarriage completely off the bus and left it demolished on its side in the median. Erica Byfield reports. Photos obtained by News 4 show the heavily damaged bus on its side in the median, surrounded by dozens of emergency and law enforcement vehicles. The front of it was barely recognizable, a mangled chunk of broken-apart machinery spread from the highway shoulder lane through the guardrail and into the grassy median, where police and first responders are seen tending to stunned children. The undercarriage, the bus wheels still attached, lay perpendicular to the overturned bus, stretching out over multiple lanes of the highway. The bus was part of a fifth-grade class trip to Waterloo Village, a historic site in Stanhope. Students on the other two buses taking part in the trip were told they had to leave 10 minutes after arriving because of a storm, and only learned of the accident when they arrived back at school. They were then reunited with their families. The school bus is still on the guardrail -- and for several minutes, the grassy median was a makeshift ER as rescue workers did their best to save children and adults. Marc Santia reports. Students at East Brook Middle School, a public school serving roughly 650 students in grades 5 through 8, were picked up early from school — they found out about the accident when other students were crying in the halls. "We thought it was just a drill and people were joking around," said student Alejandro Garcia. "Stuff started coming in. We gathered around two students whose brothers were on that bus... It was just horrible what happened." The news of the deadly bus crash caused a chaotic scene inside the school as frantic parents rushed in to pick up their children. One of the children aboard the bus that crashed in New Jersey on Thursday described the chaotic aftermath of the wreck. Roseanne Colletti reports. Donald Lazorchek, who was picking up his son James, said the news was "shocking, very shocking," and he kept "hoping it wasn't my son." Another parent, Kathy Lafaso said, "It's a horrible scene," adding she would not let her child go on any more field trips. No additional details on the children or any injuries were available. Saint Clare's Denville Hospital and Dover Hospital emergency departments received 10 patients. Of them four were discharged by 4 p.m., one was admitted, two were in treatment and three were transferred to other hospitals. Morristown Medical Center and Hackettstown also received patients, though it wasn't clear how many. Parents and students were reeling after Thursday's deadly school bus crash in Mount Olive. Jen Maxfield reports. A man at the front desk of a company connected to a license plate on the dump truck said it's not clear what happened, but he did confirm the driver left the facility Thursday morning and got into the accident. It's not clear if that driver was injured. A team with the New Jersey Department of Health also responded. Route 80 is closed westbound at exit 26. Heavy delays are expected through Thursday's evening rush hour. New Jersey's tragic school bus crash on Thursday had students at a school in Paramus worried about their peers. Michael George reports. Serious accidents are not uncommon in that stretch of the busy highway. 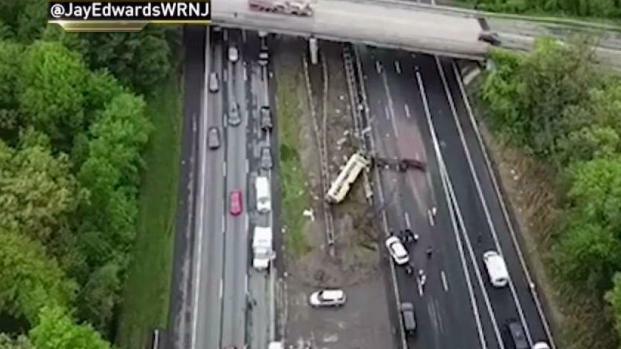 From 2014-2016 there were more than 5,000 crashes on Route 80 in Morris County, resulting in 10 deaths and nearly 1,400 injuries, according to a News 4 I-Team analysis of state data.